The production/chassis number is the last 6 digits of the VIN. Because there were a maximum of 40,000 Cabriolets built in a model year, all Cabriolet chassis numbers will begin with 0. 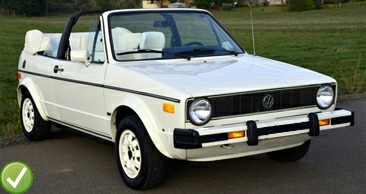 Therefore, only the last 5 digits of the VIN are required for the Cabriolet Registry. Only numbers are allowed to be entered in this section, and 5 digits are required. Your car’s build date (month and year) is stamped onto the federal compliance sticker on the driver’s door jamb in North American Cabriolets. To determine the exact date (day, month, year and day of the week) your car was built, please download the Build Date Guide. You may also provide the PKN from the build sheet or the slam panel (aka radiator support) and I will determine the date for you. You may use the Models pages to determine what model your Cabriolet is; you may also leave this field blank and I will fill it in for you. 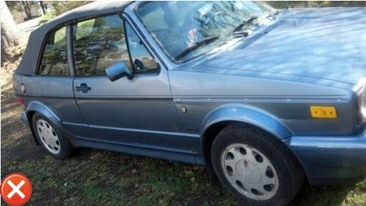 If you include a photo, I can usually determine which model it is; if the model is unknown, the default listing of “Cabriolet” will be entered. Please note: Determining the model type can sometimes be tricky, especially if the car is not 100% original; just because the car has Zandvoort wheels, for example, does not confirm that the car is a Best Seller model. An Etienne Aigner model will have an “E” as the 4th digit in the VIN (for those models initially sold in North America). 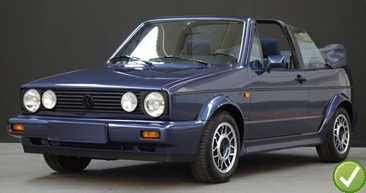 The "D" in '90s North American VINs, it has been discovered, was used mostly for Carat models, but is also found in some Wolfsburg Edition models. 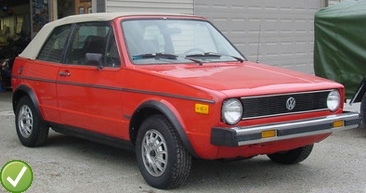 The color your Cabriolet currently is; even better is the factory color code. 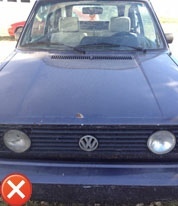 The paint color code is listed on the build sheet sticker in the trunk, if your Cabriolet still has the sticker. If the car has been repainted, please include the car’s original color: If you do not know the original color, usually the interior portions are not painted (trunk, door jambs, under the carpet, under the rear seat, the engine bay); use this as your cue to what the original color was. Select manual or automatic. This is the transmission the car left the factory with. If you or a previous owner have swapped the transmission type, please include this information in the “notes/additional info” section. The original location the car was sold (state/province and/or country). For security and privacy reasons, cities will not be listed even if you provide them. The current location where the car resides (state/province and/or country), or the last known location. For security and privacy reasons, cities will not be listed even if you provide them. Living = Currently running, driving, and/or undergoing restoration. Dying = Currently for sale by a junkyard/salvage yard, rotting away in a back lot, etc. (i.e., may have damage, but has potential to be restored). Dead = In a junkyard, or is being parted out with no chance to be saved; or car has been crushed. Provide whatever information you’d like: link to an online photo gallery, details/short story about the car, modifications made to the car, current mileage, and so on… but keep the information brief (there is now a 330 character limit). 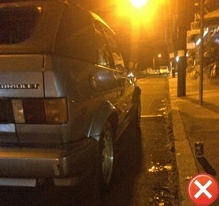 Attach one photo of your car, if desired. Any visible license plates will be blurred/blocked by me for the car owner’s security/privacy. Photos may be cropped to fit the space. Do not take photos in vertical (portrait) format! If using a phone/tablet, please rotate the device into a horizontal (landscape) position to take a photo. The best car photos are those that are taken in a ¾ position and during daylight hours. I submitted my car but don't see it listed? The information you provided was conflicting, or was incomplete as of the last update. Examples: 1) You selected 1979 for the year, but the production number entered was 19206, a number far higher than what Karmann produced for 1979. 2) You entered 00834 for your 1985's production number, but entered May 10, 1985 for the build date. Either the production number was entered incorrectly, or the car's build date was entered/calculated incorrectly. 3) You entered an invalid VIN, such as 71642. Please resubmit your car. The new submission form now requires a 5-digit chassis number and only a number to help prevent errors. What do the symbols in the Registry mean? The > means that a change has taken place. For example, "Helios Blue > Paprika Red" indicates that the original Helios Blue paint was changed to Paprika Red.